*A small hoop containing a horsehair mesh, or a similar construction of string or yarn, decorated with feathers and beads, believed to give its owner good dreams. Dreamcatchers were originally made by American Indians. **Krug od vrbove grančice s mrežom od vlasi konjske grive, ili slična konstrukcija s vunom, urešena perjem i kuglicama. Američki indijanci su vjerovali da svom vlasniku donosi dobre snove, te je tako nazvan hvatač snova. 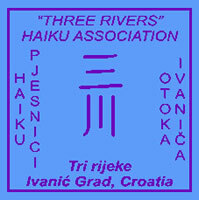 The Haiku Association „Three Rivers“ from the town of Ivanić-Grad, Croatia wishes to thank all the poets who send in their work, thus helping us all to bring to consciousness the problems of migratory birds nowadays. We are thankfull to Public Institution GREEN RING of Zagreb County for all this institution does in protection of Nature, especially, connecting the haiku poets with their programmes of Nature protection. Our gratitude to the judges of the International haiku contest, Mr. Eduard Tara, Ms. Iliyana Stoyanova and Ms Marta Chocilowska. They have done a great job on judging. And of course, many thanks to the people of the Ivanić-Grad city administration on support to our association.